This is one of the oldest methods of temperature recording. The temperature is recorded in paper chart papers. The chart paper comes in duplicate. We can use chart recorders for recording temperature during storage and transportation of temperature sensitive perishable products. Examples are food, medicines, vaccines, fruits, vegetables etc. 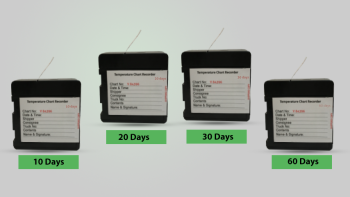 These are single use disposable recorders operating on battery. The battery is a long lasting type with up to 1.5 years shelf life. Each device has a separate serial number and the chart indicates the serial number and hence is traceable. We supply strip recorders for various duration and temperature ranges. 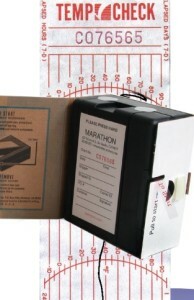 The chart recorder is in the shape of a box as seen in this image. There is a roll of paper which will generate a black mark when scratched. There is a small motor similar to that in a quartz clock. This has a small battery too. Also, there is a bimetallic thermal needle. This needle is pressed against the paper. This needle changes its position across the paper based on the temperature. Once the chart recorder is activated, the paper roll starts moving. The thermal needle presses against this paper and continuously produces marks which finally produces a graph. Brief specifications of a paper chart recorder are as below. Standard products are available in the temperature range of -30°C to 40°C. Other temperature ranges including high-temperature recorders are available on special request. The accuracy of reading of a strip chart recorder is ±1.0°C. Battery life is generally 1 to 1.5 years. We offer a discount if used chart recorders are returned to us. The recorders are available in various recording duration depending on your storage/transportation needs. Basically, the device will be the same, but the length of the chart paper inside the recorder will be of different length. You may not be able to change the chart paper yourself since we supply in sealed condition. Recorders of following durations are available. 10-day charts which can record up to 10 days. 20-day charts which can record up to 20 days. 40-day charts which can record up to 40 days. 75-day charts which can record up to 75 days. 90-day charts which can record up to 90 days. The operation is simple. Each recorder has a blank tag affixed onto it. You have to write the trip details like the truck number, date and time of starting etc. There is a plastic tab on one side of the recorder. Once you are ready to start the trip, simply pull out the tab. This activates the battery and the recorder starts working. Once the trip is finished. simply open the box and take out the chart paper. You can see the entire graph in duplicate. Few of the major advantages and disadvantages are listed below. It is very easy to operate and does not need any computer to download the data. Once the trip is over you can simply pull out the graph to check the graph. You do not need any computer to check the data. However, it is a bulky box compared to present day electronic recorders. You cannot see detailed readings. You can see only an approximate graph. In an electronic data logger, you can see exact readings throughout the whole trip. 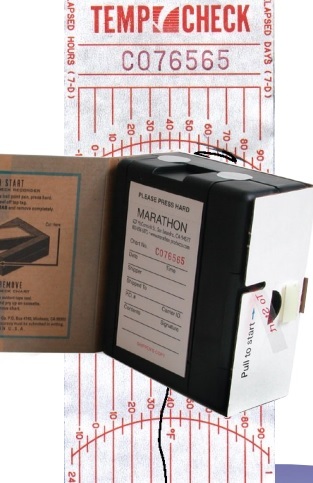 The accuracy of a paper chart recorder is very low compared to an electronic data logger. 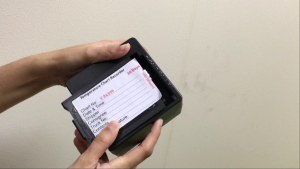 We supply the temperature paper recorders in boxes, each containing 20 recorders. The cost of one box of 20 recorders is USD 600.00 Ex-works. The cost for this box at our Dubai office is AED 2,900.00. You may contact our office for exact prices. If you are looking for a disposable type of electronic data logger please see our USB type single use data loggers. Please visit our page for more details on various types of electronic data loggers. Vacker group supplies various temperature monitoring data loggers &real time monitoring solutions across all Middle East countries including UAE, Kuwait, Oman, Saudi Arabia, Qatar & Bahrain. Also, Vacker carries out Temperature Mapping study, validation and qualification for vehicles, cold rooms, warehouses etc. Also VackerAfrica supplies these paper chart recorders in African countries covering Nigeria, Djibouti, Tanzania, Kenya, Cameroon, Ethiopia, Sudan etc.